--from R. Boulton, _History of Magic_, 1715-16. It was not until the very end of the medieval period (ca. 1500) that a definition emerged of the witch as a person in league with the devil, and that full-scale persecution began. In the period from 1000-1500 concepts of the witch ranged from that of benevolent healer to feared sorcerer or sorceress. 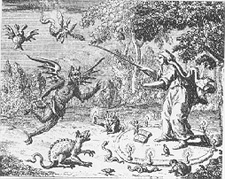 The transition from these early vague ideas of witchcraft to a fully-formed image of the diabolical witch deserves study in the history of marginality because it illustrates the rhetoric of persecution that had come into existence by the end of the medieval period. In fact, the languages of exclusion aimed at deviant sexuality, heretics, Jews, and lepers, were all utilized in the definition of the witch. Both men and women were accused of witchcraft. Even the notorious witch-hunting manual, the Malleus Malleficarum, used pronouns of both genders to discuss and to identify witches. On the other hand, the Malleus also contained statements like "No one does more harm to the Catholic faith than midwives". Furthermore, estimates indicate that, in the period of greatest persecution (1500-1700) the overwhelming majority of executed victims were female (82%). The liberal tradition: There really were no actual witches, but the concept was a product of overactive ecclesiastical fears. The Margaret Murray tradition: European witchcraft was an ancient fertility religion based on worship of the horned god Dianus. The social history view: The social pattern of witch accusations is more important than actual study of witches, if any existed. History of ideas school: Witchcraft is a composite of concepts gradually developed over the centuries. 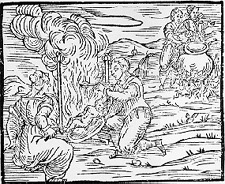 The study of witchcraft and witchcraft persecution is part of the study of women's history, especially the history of social and sexual violence against women. --from F. Guazzo, _Compendium Maleficarum_, 1608. --from U. Molitor, _De Lamiis et Phitonicis Mulieribus_, 1490. Barstow, Anne Llewellyn. "On Studying Witchcraft as Women's History", Journal of Feminist Studies in Religion, vol. 4 (Fall 1988), 7-19. Barstow, Anne Llewellyn. Witchcraze. Pandora: San Francisco, 1994. Kieckhefer, Richard. Magic in the Middle Ages. Cambridge University Press: Cambridge, 1989. Kors, Alan and Peters, Edward. Witchcraft in Europe, 1100-1700: A Documentary History. University of Pennsylvania Press: Philadelphia, 1972. "illustrations on this page may not be reproduced without permission of Thames and Hudson Ltd"